Raisonance, manufacturer and global provider of microcontroller application development tools, inspired application designers once again with the launch of the STM32 Primer2, promoting the latest STM32F10xxE devices from STMicroelectronics. Taking the concept of the Primer a step further, the Primer2 platform is doped with even more innovative interface features (touchscreen, audio, MEMS-based controls) to stimulate creativity, plus an improved power supply for increased autonomy and an “add-on connector” to facilitate hardware expansion. All of this is available in a complete, affordable tool package that includes the STM32 Primer2 hardware, Ride7 development environment, GCC C compiler, CircleOS operating system and sample applications. 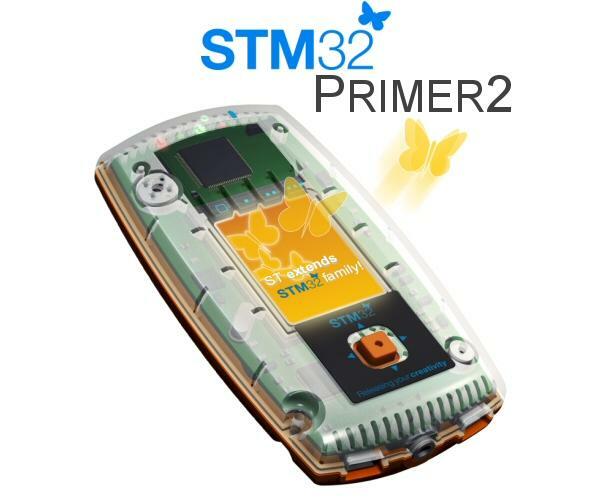 The STM32 Primer2 hardware adds a 128x160-pixel color touchscreen, a joystick/push button, “add-on” extension connector, codec-based audio record and playback, MicroSD card slot and an IrDA transceiver to the features of its predecessor. This is in addition to the tool’s USB port and the MEMS accelerometer, which is used for navigation control in the menus of the graphical interface and several applications. A range of sample applications implementing STM32 features and peripherals are available (USB, ADC, SPI, I2C), and can be easily added to the tools using the open-source CircleOS. The STM32 Primer2 makes it easy for users to learn the STM32 ARM Cortex-M3™ core based microcontrollers by combining a user friendly, creative tool environment with a collaborative online community; www.stm32circle.com. The collective experiences of the community and the wide range of shared application sources makes it easier for engineers to get their own applications started, and creates a stimulating environment for new application ideas. This exceptional range of resources and the affordability of the tools make the STM32 Primer2 “the” low-risk solution for trying out the powerful STM32 devices, and developing advanced prototypes. Extending the hardware design of the STM32 Primer2 is greatly improved over its predecessor with the addition of an “Add-on connector” allowing access to STM32 peripherals such as the ADC, SPI, USART, I2C and I/Os. The casing is easy to open for access to the connector and an opening in it allows hardware additions to extend outside the casing. All the tool’s design schematics are available for free download at www.stm32circle.com. Watch the stm32circle site for information about making or buying add-on extensions. The STM32 Primer2 in its “standard” version that allows debugging of up to 32 Kbytes of code is only available through STMicroelectronics’ distributors (ST order code: STM3210E-PRIMER). The “standard” version has a recommended resale price of $49 USD. An upgrade to remove the 32 Kbyte debugging code size limitation is available from Raisonance. 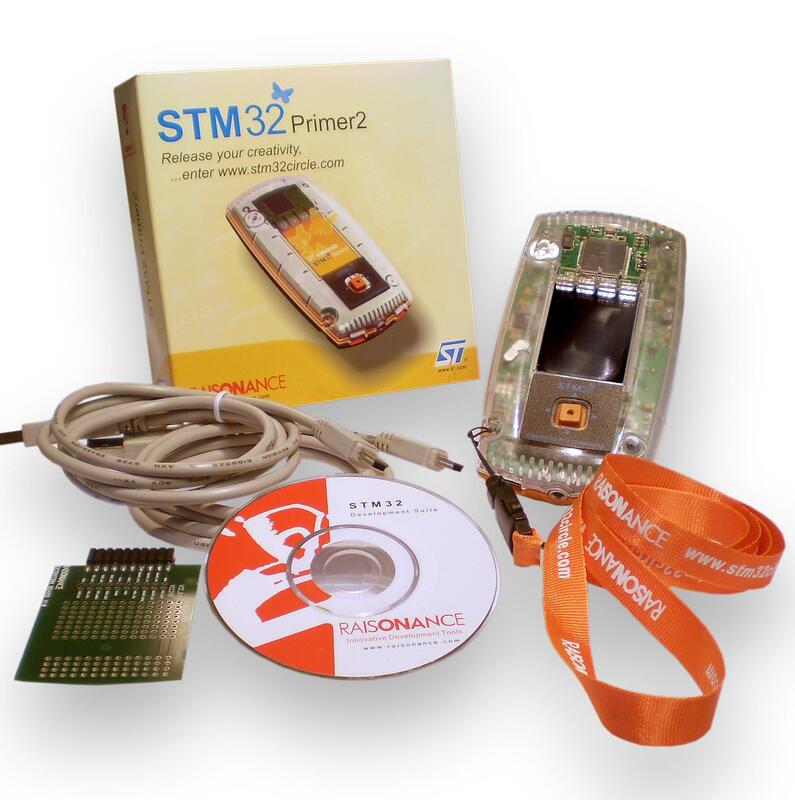 The unlimited “Pro” version of the STM32 Primer2 is resold by Raisonance and their distributors for 129 Euros (aprx. $167 USD). The STM32 Primer2 Pro includes a wrapping area on an add-on module for connection to peripherals such as ADC, I2C, SPI and USART, in order to facilitate hardware extension for advanced tool users. 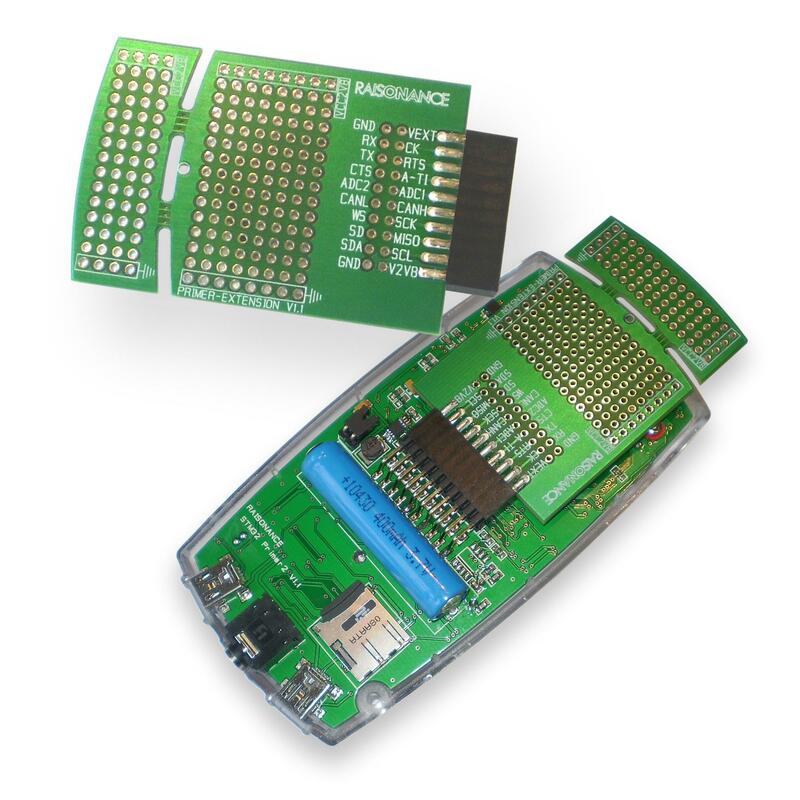 The STM32 Primer2 “Pro” also allows unlimited debugging of the target microcontroller. The Raisonance order code is STM32 Primer2 Pro.